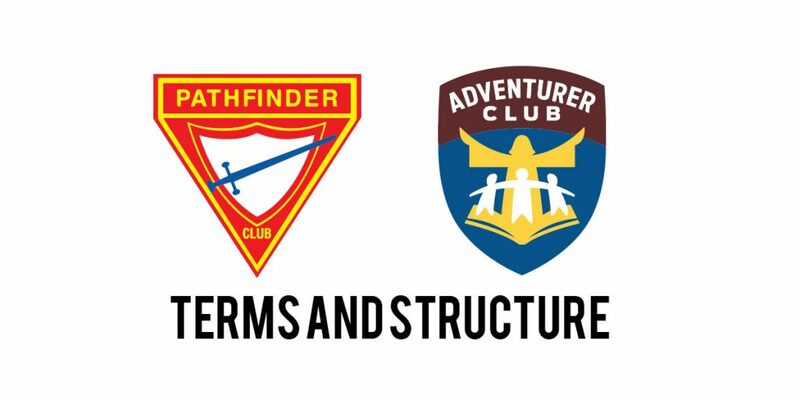 The Pathfinder and Adventurer Department (PAD) is responsible for developing, overseeing, and supporting Pathfinder and Adventurer Club Ministries here in Florida Conference. The age range for Pathfinders/Adventurers is pre-school to high school (roughly ages 4-18). ADVENTURER Ministry is a family ministry designed to help families raise their children in Pre-kindergarten, Kindergarten and Grades 1-4. PATHFINDER Ministry is a child/teen ministry created to help children grow and develop as Christians, and socially responsible young people in Grades 5-12 in Florida and Grades 5-10 in North America Division. AREAS: Florida Conference is divided into four (4) AREAS: North, Central, West, and South. 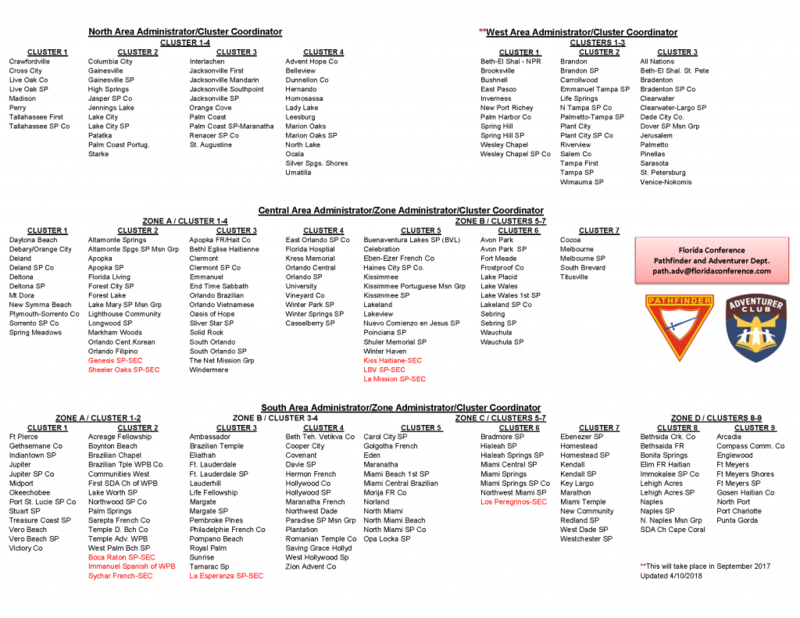 AREA ADMINISTRATOR: Each Ministry has an AREA ADMINISTRATOR, a volunteer that works closely with the Conference Path/Adv Director to coordinate a specific ministry in their AREA. ZONES: Each AREA is subdivided into ZONES and are referred to as Zone A, B, C, D. There are 6 Zones at this time (2-Central; 4-South). ZONE ADMINISTRATORS: Work with Cluster Coordinators to encourage and support their team of Coordinators. CLUSTERS: Each ZONE is subdivided into CLUSTERS and are referred to as Cluster 1, 2, 3, 4, 5, 6, 7, 8, 9. There are 23 Clusters at this time (4-North; 7-Central; 3-West; 9-South). CLUSTER COORDINATORS: Cluster Coordinators are assigned to a grouping “cluster” of 7-15 churches in a geographical territory. PURPOSE OF CLUSTER COORDINATOR: Cluster Coordinators serve as the link between a local church Path/Adv club and the Path/Adv Dept. AND serve local churches (leaders/pastors) through their presence, sharing information, support, training, and keeping the Conference Path/Adv Department aware of local needs. CLUSTER TEAM: Ideally each Cluster will have two Cluster Coordinators – one for Adventurers, one for Pathfinders. OFFICIALLY APPOINTED: The State Administrator, Zone Administrators, Cluster Coordinators are officially appointed volunteers (OAV’s) and officially represent the FL Conference Pathfinder and Adventurer Department. CLICK HERE to learn how to become an officially appointed volunteer.